The history of my father’s family goes back to the 17th century when the Édes family were noble warriors living north of the Danube in an area that was ceded to Czechoslovakia by Trianon. The Komarón/Nitra region today is part of Slovakia. Madar (Modrany in Slovakian) and nearby villages with majority of ethnic Hungarians still refer to their towns by their Hungarian names. It shows the very old Hungarian tradition of Easter Monday sprinkling where the young men of the village ‘sprinkled’ water on the young women to make them grow like beautiful flowers. The interior of the house looks much as it would have a century ago or earlier. 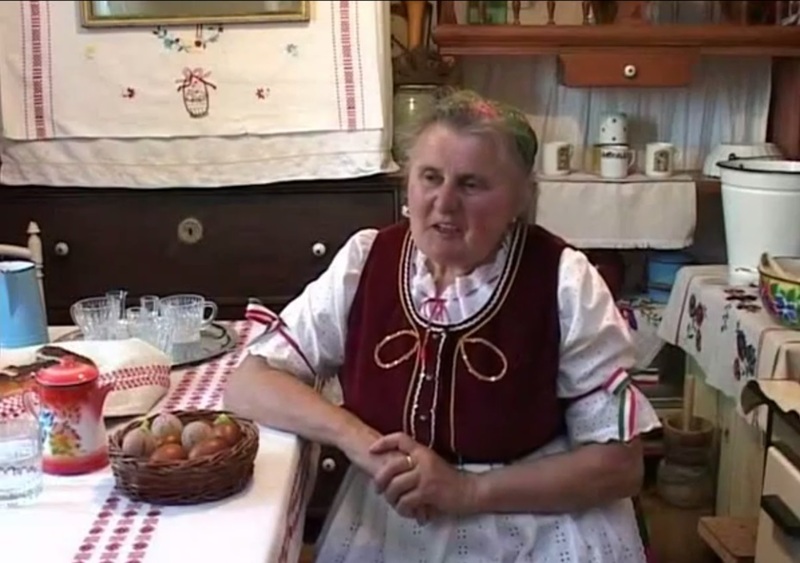 Margit Néni is telling about Easter traditions when she was a girl. Even before understanding the song and conversations, the beautiful language delights me. This summer I plan to visit the village with my brother and older sister. I look forward to walking the same dirt streets of this centuries old village where my ancestors lived so long ago. This entry was posted in Austro-Hungary, Extras, Genealogy, Komárom, Madár and tagged Hungarian Culture by edesorban. Bookmark the permalink.